Hoodie for Best Start to the Year: Senator Tom Carper. He introduced S. 132, The New Columbia Admission Act (aka: DC statehood bill) at beginning of year as his term as Chairman of the Homeland Security and Government Affairs Committee (HSGAC) began. In late 2012, the outgoing chair of HSGAC, Joe Lieberman (I-CT), introduced the statehood bill in the Senate for the first time in 15 years which was nice but gave the bill no chance of having a hearing. Having the new chair of the committee introduce the bill early in the 2013 Congress was a darn good start to the year. Thanks Senator Carper! At Frederick Douglass statue dedication, I discussed a cause championed by him: DC deserves statehood & Congress should act to grant it. Hoodie for Non-Conformism: David Grosso. As the Mayor and City Administrator prepared to brief the Council on how the District would shut down due to congressional stubbornness and ineptitude, Councilmember Grosso spoke up demanding that the District simply ignore Congress and the law and not shutdown. This is the type of out of the box thinking the statehood movement needs more of. Thank you Councilmember Grosso! Hoodie for Leadership: Mayor Gray. The mayor had readied a plan to shut the District down but when CM Grosso and others spoke up against it instead of digging his heals in he listened and then developed his own plan to keep the District open. Good listening skills are a component of good leadership. Oh, and confronting Harry Reid was a good move too as it didn’t seem to ‘screw’ anything up. Thanks Mr. Mayor! Hoodie for Cartography: Geoff Hatchard. Yeah, all of our long winded speeches about why statehood is constitutional can all be summed up with this great map of the proposed state created by Geoff Hatchard. It’s been our most effective teaching tool about statehood with District citizens and congressional staff. Cartography rocks and so does Geoff! Hoodie for T-Shirt Design: CreateDC. The “I AM ESSENTIAL AND SO IS STATEHOOD” phrase was coined by yours truly but the graphics were done by my talented older brother. By the next morning when the shirt design was tweeted out a furor of enthusiasm was created by people wanting shirts that had a simple message confirming our own individual values and our collective yearning to be treated equally with our neighbors as a state. Hoodie for Great Neighbors: Sen. Barbara Mikulski (D-MD), Sen. Ben Cardin (D-MD), Rep. Donna Edwards (D-MD), Rep. Bobby Scott and Rep. Gerry Connolly (D-VA). These fine elected members of the Maryland and Virginia delegations are cosponsors on the respective statehood bills. It’s nice to have supportive neighbors, so thanks to all of them (Senators Warner & Kaine and Representatives Van Hollen, Hoyer, and Moran we’re waiting…). Hoodie for the Fourth Estate: Martin Austermuhle. Whether at DCist or WAMU Martin has done a stellar job of keeping us all aware and abreast of how District or congressional actions affect the District’s push for equality. Toward the end of the year Martin penned a piece that explained the historical context and maneuvering that brought about passage of the Home Rule Act 40 years ago. His work has kept us all up to date and better informed. Thanks to Martin and all the great reporters in this fine city-state! Hoodie for Narrative Expression: Joan Shipps. Joan had two great Op-Eds published this year in The Hill and in the Cleveland Plain Dealer. Her narratives have helped spread our message to wider audiences than before and she’s done a great job of educating her readers through her Op-Eds. We all should be inspired by her efforts and emulate them in papers across the country. Thanks Joan! Hoodie for Walking the Talk: Anne Anderson. Anne has been working for statehood for decades and has been walking the talk for years organizing her friends and her professional network to care about statehood. If more of us followed her lead, we’d be in a much better place. More action and less talk is an admirable trait. Thanks Anne! Hoodie for Unpaid Elected Leadership: Nate Bennett-Fleming. Yes, we need to fund the statehood movement and thus the statehood delegation but unpaid Shadow Rep. Nate Bennett-Fleming and his band of unpaid interns showed that a lot can be accomplished at no pay. Hoodie for Attempting to Put Money Where Our Mouth Is: Vincent B. Orange. Councilmember Orange introduced a bill to fund the Shadow Delegation and thus provide the first real District resources to the statehood cause. The bill has gone nowhere but it has started a conversation which a good first step. Thanks CM Orange, but we wish you had shown up for the hearing on your own bill. Hoodie for Best Business: Askale Café & The Argonaut. Both of these fine establishments have hosted our meetings and supported the statehood cause, for that they each deserve a ‘Hoodie and so much more! Thanks to them both! 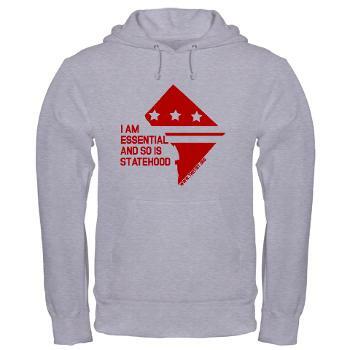 Hoodie for DC Statehood Oratory: Johnny Barnes. If you want to learn both the history of the modern statehood movement and be inspired to believe we’ll achieve it soon you need to listen to Johnny give a speech about DC statehood. He is THE BEST (sorry VO) and his great oratory is backed up by years of hard methodical work for the cause. Thanks Johnny for your inspiring oratory & hard work! Hoodie for Hypocrisy: Jim Jordan. This small government conservative decided to draft a bill to gut all District gun laws. One minute he believes the federal government extends its reach too far into people’s lives the next he wants to use the federal government to overturn local laws passed and supported by District residents. Jim Jordan, you’re a hypocrite. Hoodie for Acknowledging Hypocrisy: Rep. Trent Franks. As a super-super small federal government conservative it was odd that he introduced a bill again to restrict abortions just in the District of Columbia (similar to Sen. Mike Lee’s bill) but this year was swayed to make the bill applicable to the whole country. It’s not much but it refreshing to see some semblance of guilt by Rep. Franks, acknowledging that his actions were hypocritical if he wants to impose federal laws on the District but not everyone else. Hoodie for Worst Bill Almost Offered: Rep. Kerry Bentivolio. This undistinguished member of Congress drafted but ultimately chose not to offer a bill to halt the use or the installation of District speed cameras. This idiocy speaks for itself and the only semblance of intelligence that crept out of this whole affair was that the bill was never offered. Hoodie for Acquiescing to Congress (for a bill not offered): Vincent B. Orange. So a dumb bill wasn’t even offered in Congress yet CM Orange offered a bill to stave off the bill that was never offered thus giving Rep. Bentivolio more credence than he deserved. Mr. Orange should have challenged Rep. Bentivolio (as some leaders did), mocked him (as some in the media did), and then ignored him. Acquiescing was not the right move. Hoodie for Self-Inflicted Affront to Democracy: The Council’s Attorney General Vote. The Council voted to override the voters of the District and push off the election of the attorney general for four years. It weakens our case to be fully included in democracy when our Council acts to subvert democracy. Runner-up Hoodie for Self-Inflicted Affront to Democracy: The Council’s Move on the Height Act. From a statehood stand point the issue isn’t about tall or short buildings the issue is whether or not the District should be making that decision or Congress. The Council acted ineptly and gave Chairman Darrell Issa the chance to wonder if we really want to have more control over our own affairs. Ouch! That’s a wrap folks and I hope you all strive to achieve a Hoodie for Good Deeds in 2014, a lot of people deserved accolades this year (Kelli, Phil, Amanda, Dan, Kayvan, Jaime, Elinor, and on and on) but I just didn’t have enough pages to give all those deserving recognition and I hope the task of narrowing the field of recipients is even harder next year (for the good ones at least). Achieving statehood will not come from sitting back and waiting for others to act, it’s incumbent upon all of us to own the statehood movement and do something positive and productive for it. Thanks to you all for a great year, here’s to a better one in 2014, and here’s to reaching a point when we don’t have to ask or demand to be treated equally! I am honored to accept the 2013 “Hoodie” Award for Walking the Talk. Look forward to hiking along with all of you toward joining the United STATES of America in 2014! Happy New Year!